Young people with learning disabilities are often bullied, physically hurt and left out of everyday life. Many are unable to find jobs and are left with little to do. Last year, staff and customers of The Co-operative decided to help this group by selecting the learning disability charities Mencap and Enable Scotland as its charity of the year partners. 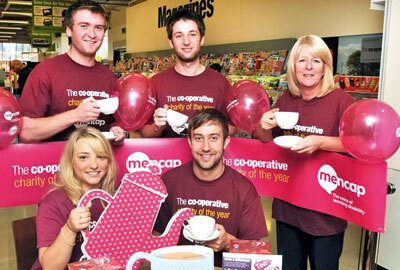 The partnership raised more than £7m, the highest amount ever raised by the Co-operative. The charities have used the money to launch a new programme, Inspire Me, which will provide support to more than 25,000 young people aged between 16 and 25 with learning disabilities. The programme will provide young people with practical activities and training to build their confidence and learn new life skills. The partnership primarily raised money through employee fundraising. This was achieved through in-store events such as dress-up days and bake sales, as well as mass-participation events including a five- kilometre Santa Dash that raised more than £40,000. The Co-operative Group gala dinner, in December 2011, raised more than £400,000 in just one evening. The Co-operative's suppliers also got involved by running cause-related marketing initiatives. Household goods company Procter & Gamble, for example, donated 3p from the sale of a selection of its products during August 2011. More than half of Co-operative staff said they felt more motivated as a result of the partnership. Mencap and Enable Scotland have increased their brand awareness among the 106,000 Co-operative employees and six million customers. Reza Motazedi, head of charities and not for profit at Deloitte UK and one of the category judges, said: "There was good management and the partnership helped a very large group of disadvantaged people."